Pablo Bronstein is one of the most exciting artists of his generation, combining interests in art and architecture with performance, installation and sculpture. Bronstein has described his Beach Hut in the style of Nicholas Hawksmoor as a ‘monument to architecture’, paying homage to the quintessentially English architectural vocabulary of the 18th Century Baroque architect, Nicholas Hawksmoor. In the 18th Century the use of this heroic style was chosen deliberately for lighthouses along the south east coast because of the defensive nature of the line of ports and castles from Hastings to Dover. 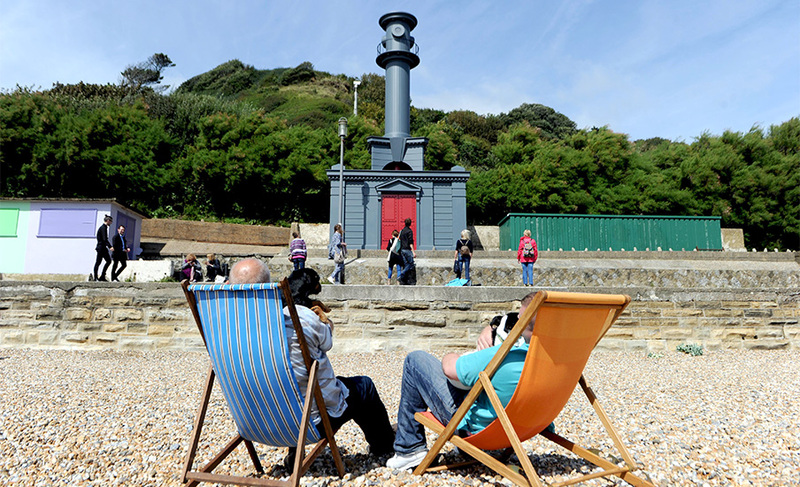 This architecture no longer exists in Folkestone, therefore Bronstein’s work will take the form of a lighthouse, filling a gap in the town’s history. Situated next to other brightly coloured beach huts on the water front, alongside the Council's mundane arrangements for park maintenance, Bronstein's sculpture's dramatic presence invokes a delightful and piquant sense of folly. Bronstein was born in Buenos Aires, Argentina in 1977 and lives and works in London and Deal, UK. Solo exhibitions include: Metropolitan Museum of Art, New York (2009); Sculpture Court, Tate Britain (2010); Institute of Contemporary Art, London (2011); Centre d’Art Contemporain Genève (2013; and REDCAT, LA (2014). Group exhibitions include: Tate Live: Performance Room at Tate Modern, London (2012); Manifesta 8, Murcia, (2010-2011), Performa 07, New York (2007); and Tate Triennale, Tate Britain, London (2006). Forthcoming solo shows include Museo Marino Marini, Florence and Nottingham Contemporary, Nottingham (2015). 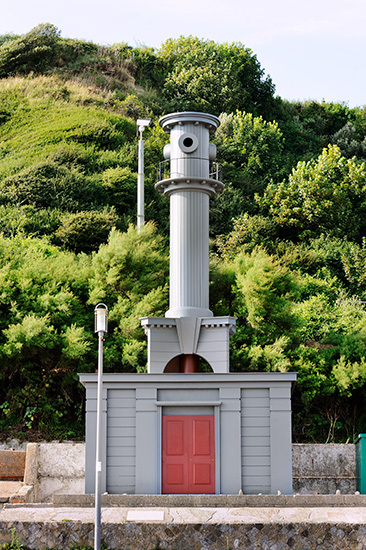 Pablo Bronstein’s contribution to Folkestone Triennial 2014 is an UP Projects production for the Creative Foundation.